Spain is located in the south western corner of Europe and consists of the Iberian Peninsula, the islands of the Balearics and the Canaries and the cities of Ceuta and Melilla located on the northern coast of Morocco. To quote the official tourism portal for Spain – “Spain has what you want, Spain has what you need”, and as one of the world’s most popular tourist destinations, they aren’t wrong. 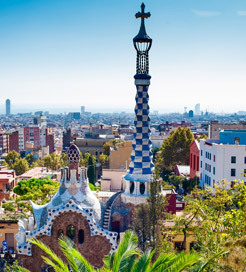 The land of flamenco and bullfighting, Spain feature a mixture of culture, beautiful architecture, monuments and UNESCO World Heritage sites spread across its wonderful and dynamic cities such as Barcelona, Madrid, Valencia, Bilbao, Seville and Granada. In addition to the world famous cities that draw the tourists in year after year, some 4,400 miles of coastline and in particular the Costa del Sol attract sun worshippers in huge numbers. The country is well known for its gastronomy too and with dishes such as paella, gazpacho, the Spanish omelette, cocido and tapas, Spain undoubtedly has all the ingredients to make your visit an unforgettable experience. Getting to Spain by ferry is relatively simple with numerous choices worth considering, both direct and indirect. The direct routes on offer from the UK cover a selection of departure ports in Southern England sailing to a choice of ports on Spain’s north coast. The crossings are quite long and aren’t especially low priced but are operated by the finest fleet of ferries you are likely to come across so the journey is worth the expenditure. You could also choose to travel to Spain from England via France on a shorter and cheaper crossing and then drive the rest of the way. If travelling by ferry to Spain from Ireland, as there are currently no direct routes you’ll need to go via France or alternatively travel via the UK. Spain features numerous connections with the Balearics and Canaries, great if you’re using the mainland as a gateway to one of the fabulous islands such as Mallorca, Ibiza, Tenerife and Gran Canaria. For more information, please visit our Ferries from Algeria to Spain page. For more information, please visit our Ferries from Menorca to Spain page. For more information, please visit our Ferries from Rome to Spain page. For more information, please visit our Ferries from Ireland to Spain page. For more information, please visit our Ferries from Formentera to Spain page. For more information, please visit our Ferries from Sardinia to Spain page. For more information, please visit our Ferries from La Palma to Spain page. For more information, please visit our Ferries from Tenerife to Spain page. For more information, please visit our Ferries from France to Spain page.